(back row) Mark Callihan of KMPG with award winners Todd Headley, Adrian Muniz of Logi Analytics, Jennifer Felix of Vencore and Mark Lynch of Appian. Front: Christine Bailey of Accenture Federal Services. 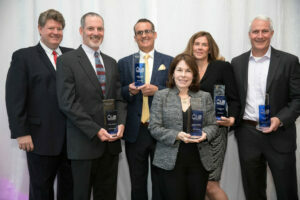 Market Connections would like to congratulate Accenture Federal Services’ chief financial officer, Christine Bailey, along with all other nominees and awardees at Northern Virginia Technology Council’s (NVTC) Annual CFO Awards Ceremony held Monday, June 4 in Tysons Corner, Virginia. The 22nd annual NVTC CFO Awards recognize local chief financial officers for outstanding achievement and excellence in promoting the area’s technology community. In addition, to the awardees above, NVTC also honored Todd Headley with the Michael G. Devine Hall of Fame Award for his contributions to the Greater Washington technology community. For more information and the full list of nominees in each category, visit NVTC’s announcement page.